Real alchemy is the art of making quintessences, truly magical psycho-spiritual sacraments that expand consciousness into transcendent levels of experience. One point of distinction between true alchemical quintessences and entheogens used as sacraments in shamanic traditions, is that our quintessences act on a psycho-spiritual level without having any psychoactive compounds in the source materials. That is one of the proofs for having obtained true quintessences through real alchemy. As one of the two main branches of the Hermetic Arts, the branches being magic and alchemy, practical alchemy has much to offer. Firstly, the true power behind what makes natural magic work is an alchemical mechanism itself. Understanding the link between magic and alchemy then makes for more effective applications of the magic inherent in particular forces and natural substances. Secondly, in reference to substances, those alchemical substances of legend, called quintessences, are obtained through the ancient art of practical alchemy (i.e. laboratory alchemy). Quintessences contain the true, deep, natural magic that bestows direct initiatory experiences of evolutionary unfoldment that are what practitioners of magic are often searching for, if they are approaching magic as a sacred initiatory science. There are many things to clarify, however, in order to get specific about what real alchemy is on a physical laboratory level. For the last 150 or so years the idea has been circulated, mostly by turn-of-the-century magical fraternities and the influence of “theosophical” teaching, that true alchemy is only an inner, spiritual process. Further notions of this misinformation were reinforced by the work of Carl Jung, who has commented extensively on ideas about alchemy even though he was not actually an alchemist. He contributed greatly to the conversations about archetypes (though also distorting their original definition at the same time) and psycho-spiritual levels of reality, which did much for the then fledgling field of psychology, but very little to advance proper ideas about operative alchemy as a practical initiatory science. Despite the ability to learn real alchemy and thereby prove to oneself the irrefutable nature of it, there are still many holding and promoting ideas to the contrary. The fact is that it is far easier to stay in the nebulous gray area and give countless pseudo-spiritual exercises and workshops, than it is to be accountable for whether or not one’s students can actually achieve quintessence and have experiences from them that are irrefutable quintessence experiences; real alchemical experiences lead to substantial experiences and personal transfigurations. Most of the ‘teaching’ that circulates about alchemy is put forth by people who have no training in real alchemy. It is not always disingenuous; it is largely due to misinformation that has simply been perpetuated. This has allowed not only incorrect teaching about alchemy to persist, but also the insertion of all kinds of other things that have zero relation to alchemy at all to masquerade with its name. It is a cycle that some modern adepts have been content to allow to continue to conceal the deeper path from those who are easily deceived due to inexperience. That cycle of misinformation needs to be corrected in order to move a deeper level of esotericism into the community. The more truly spiritual seekers who step into real alchemy work, the more the misinformation will be brought into balance, allowing the evolution being sought to accelerate. Alchemy is a word that is been around for a really long time that has many perceived connotations. 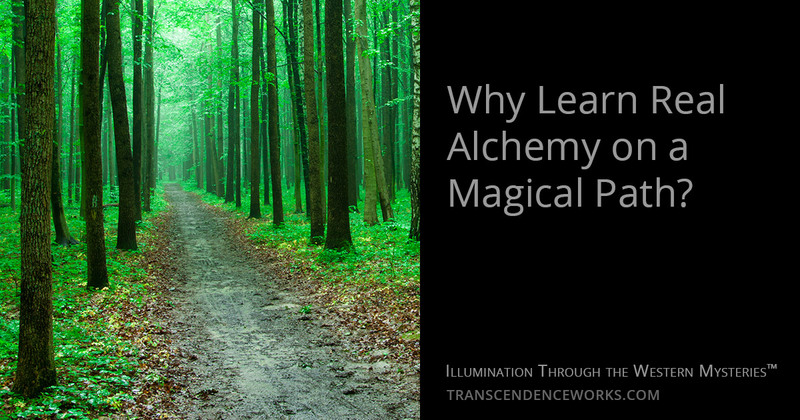 Because of that and for many, many reasons, most ideas about alchemy are not really accurate. This is to be expected since it is a mystery teaching and it is not referred to as a Mystery for no reason. There is a lot of information that has to be given by instruction from someone that really has direct experience. Otherwise, one is left to groping in the dark. Alchemy from a higher level is simply the mechanics of how everything exists. Everything that exists came into being through a particular process or mechanism. Modern day alchemists often refer to that mechanism as a ‘spagyric’ mechanism, which refers to the nature of things evolving through a process of being separated, purified, and recombined continuously to create the field of existence and everything in it. That term, coined by Paracelsus, is really a somewhat more descriptive way of saying alchemy. The mechanism is one of the things that is really important because it allows the alchemist to see how things are held together while they are in what is referred to as consensus reality. How things come together, how things separate, and how those different processes and aspects can be manipulated and used to create spiritual medicine, which alchemists call quintessence, is the main purpose of laboratory alchemy. The reason that spiritual medicine is called quintessence is because of the ideas of the ancient four Philosophical Elements of Earth, Air, Fire and Water. They are not the literal earth, air, fire and water that are easily experienced. They are called Philosophical Elements precisely because they are something else. Those four Elements when they are obtained, purified and recombined into one new homogeneous essence are then what alchemists call the fifth Element, which is why it is called a quintessence because ‘quint’ means ‘five’ in Latin. On one level, alchemy is about understanding how everything fits together. On a practical level, alchemy is about making quintessences which are spiritual medicine, true sacraments that accelerate evolution; the reason real alchemy focuses on quintessences is because they have an effect on multiple levels of being, they are truly psycho-spiritual medicines. Some of them are rejuvenatives, some of them work on different levels and do other things. They interact with various aspects of consciousness and many of them act as correctives for imbalances in the psyche. So dysfunctions, distorted patterns, and things like that get purged by quintessences causing a transformational shift back towards a pure pattern. As spiritual medicines, quintessences bring one more into alignment with the higher state of a purified (less distorted) consciousness. Those medicines have a long history of being talked about—the most renowned being the Philosopher’s Stone. The idea behind the Philosopher’s Stone that people are the most familiar with is that it turns lead into gold. There are different groups teaching alchemy that say that is not true and some of them say it is. Some of them say practical laboratory alchemy does not exist or is not the ‘real alchemy’ (as though proffering that opinion makes them somehow ‘more spiritual’); but, for those of us that actually do practical alchemy, that assertion is obviously incorrect. Still, these are ideas that have been bandied about for the last 150 years and there is still great debate over them in various levels of the metaphysical community. The reason it is important is because when seekers learn practical alchemy work in the beginning, they are working in the plant kingdom. They get to take a plant, and learn to separate it into its Philosophical Principals, called Salt, Sulfur and Mercury, which correspond to the physical levels of the body (structure), soul (energy) and the spirit (intelligence) of the plant, respectively. That concept is a little foreign and weird to people sometimes. Eventually they wrap their minds around the fact that everything is Mind, so everything that exists came from One Mind and was formed through differentiation and recombination to create all of the levels of reality, as made very clear in The Emerald Tablet of Hermes, a cornerstone of alchemical teaching. Because everything is mind stuff, once that concept is grasped, then the realization of what is really being done, even in physical laboratory alchemy, is that certain levels of Mind are being manipulated—it is just that they can be seen and touched. That is a key concept within real alchemy teaching. Each of the physical levels of those Principals also has a non-physical level. The non-physical levels of the observed Principals are what an alchemist is primarily concerned with understanding, in order to move the non-physical level of each of the Principals from one medium into another, in order to use it in a particular way. Those are the mechanical parts. What one gets to see in addition to the body and soul and spirit of a substance, once they are separated and purified, is to learn how they are put back together to create one new thing—because they only go back together one way, and only with the right process. One of the main points of seeing this laboratory aspect of real alchemy is that one then knows how that mechanism works within one’s own being, because alchemy is an Hermetic art, and in Hermetics if it is true on one level, it has to be true on all levels. Laboratory alchemy illuminates the process for accelerating the evolution of a substance, while reflecting the same exact process that must be done on all levels within the totality of the aspirant’s entire being, not just fragmented pieces of the psyche. How it is applied on each different level is not obvious and that is part of alchemy training on other levels. Something is either true on all levels or it is not really a truth in a capital ‘T’ sense of the word, so alchemy training affords one the experience to see how things are actually able to be taken apart, put back together, and made into a spiritual medicine that then has an initiatory effect upon consciousness. Quintessences expand consciousness to where more can be understood about the nature of real alchemy, so it is an interesting puzzle box created by nature as a labyrinth one can work through as one learns to confect quintessences from the different kingdoms, that each in turn open different functions in consciousness. The beginning work in alchemy should be in the plant kingdom (called the Prima work), but then progresses to minerals (Secunda) and metals (Tertia). The mineral and metallic substances are more powerful, which is why they are not taken in the beginning, aside from being more difficult to obtain without proper skill. The nervous system has to be prepared to be able to ingest spiritual medicines of a higher power or dosage. Plant quintessences condition the vessel of the body to prepare for medicines with increasingly powerful evolutionary forces. The ultimate spiritual medicine from the viewpoint of alchemy is what is called the Philosopher’s Stone, which is basically a physical substance that functions rather like a chariot for pure evolutionary God force, which is why it transmutes substances on a very powerful level. That Stone, once obtained (and tested), is then made into a medicine which is called the Elixir of Life: It is essentially the ultimate longevity pill, from the Western alchemy point of view. It was discussed in Eastern traditions, but it was downplayed over a period of time, because in the East they focused more on mental powers, what they call the siddhis—the powers that can come about as the result of expanding consciousness. However, in reading about the mahavatars and the powers they attain in legends from Eastern tradition, they all say that they maintain their longevity and their power by the processes that they do mentally AND what they call the Golden Pill, which is their version of saying the Philosopher’s Stone… or something very close to it. So these traditions are ancient in both the East and the West; they have persisted for millennia. The word ‘alchemy’ is used ubiquitously, from concepts of high finance all the way into popular fiction, like the Harry Potter series. The reason the legends have persisted so long is because there is truth underneath them. There is a tendency for things that are true to stick around in a perennial way even if sight of what the actual truth of them is gets lost. Real alchemy training is one aspect of the Western Mysteries that is the most neglected, because very few people understand how to do those processes in a way that is really correct and useful. If the purpose behind the Work is not understood, then one is just basically back to chemistry. Chemistry leaves out the Mind component of things (though quantum mechanics is catching up), and of course, the objectives are different. Chemists are usually concerned with applied sciences and the physical levels of things. They are not really after spiritual medicine; they are after something else. Alchemy has a purpose of giving a solid blueprint and a working template for one practical path to illumination through the Western Mysteries, and that is what Western esoteric spiritual seekers are missing for the most part. One beautiful thing about real alchemy, because of the way it works, is that it can be it is own spiritual path. Yet, if one is inclined to other spiritual traditions, alchemy cleaves into every one of them, perfectly, because it is all about the mechanism and the blueprint underlying most aspects of religions (which are preserved and taught allegorically) in the first place. So, alchemy has no conflict with any religious path, though adherents of many religions do not see it as such. There are Christian, Judaic, Islamic, and pagan alchemists. There are many kinds of alchemists that follow different spiritual traditions, because they have a cultural affinity with them and they can see the alchemical process within the allegorical truths of how their own spiritual traditions are mirrored, and vice versa. Alchemy is a practical discipline to approach the trinitarian aspects of most religions. Most religions have a trinity of some kind, as reflections of the nature of universal functions, and in alchemy the trinity is the Philosophical Principals of Salt, Sulfur, and Mercury as the body, soul, and spirit. Those Principals correspond with the Son, the Holy Ghost, and God the Father in the Christian Mysteries, and with Shiva, Brahma, and Vishnu within the Hindu pantheon. They are reflected in Jewish Mysticism within the natures of the Ruach, Neschamah, and Chia of initiatory Qabalah. Even Earth-based magical traditions have trinity aspects within the Triple Moon Goddess, where the phases of the moon have allegorical meanings and individual personifications. Trinities line up in a way where taking religion and stripping off all the doctrinarian specifics and the dogma, one is left with all the working parts, which then illuminate how things function. Then one can understand any religion, if it evolved from a basis of true experience, and see which part of a religion is a result of a particular alchemical aspect to see where it originated. That in itself is illuminating and liberating, because universal Truth can then be seen from a more expanded perspective. So, an alchemist can exist pretty much in any religious environment (excluding fundamentalism) because even though they see things from a more overarching level, they can also see the truth underlying it even if the people who are following it do not see the truth in it as the alchemist can. So true alchemy has a lot of benefits on many levels, the majority of them relate to consciousness expansion. The methods learned in real alchemy work lead to profound esoteric knowledge, wisdom, and understanding when they are applied to different practices within the Western Mysteries. Most of the information that passes as ‘esoteric’ in the metaphysical community is not really esoteric at all. Esoteric means hidden, and although it is perfectly normal to want to read and research things that discuss true esotericism, the vast majority of things one can read in a book do not qualify as esoteric, whether they are labeled as such or not. True esoteric knowledge comes from direct experience gained by applying occult science to particular pursuits of understanding within specific streams of the Mysteries. As far as gaining true spiritually useful understanding about the underlying nature of reality, there is nothing within the entire realm of occult science more practical than laboratory alchemy. Unlike other streams within the Mysteries, where seekers can fool themselves or others into thinking they understand something, in real alchemy there is no way to fool oneself. The result of the Work is either a quintessence or not. The truth is people can talk about alchemy all day long, and nearly every esoterically inclined spiritual person will acknowledge it as real on some level, but ask any of them ‘how’ to obtain a real quintessence and they will have no useful information. It is not that the information is not available, it is that most people simply have not made enough effort to get to a more substantial level of the information that does exist. Since alchemy is an ancient tradition left to us through the writings of real adepts who were true Sons of the Art, and who more often than not wrote cryptically to preserve their secrets, it is true that the information is difficult to penetrate on one’s own. Thus, in addition to the writings, it is also a longstanding part of the Royal Art to have a teacher who can properly instruct one in the beginning work of real alchemy and lay a proper foundation for one to be able to explore other realms on one’s own. Exploring those otherwise unknown areas of the Mysteries is the truly esoteric knowledge that I am talking about, learning real alchemy from the book of Nature herself. This is a phrase used often in this area of study, and many think observing nature outside will somehow reveal deeper alchemical secrets. While it is true that we can observe macro level alchemical processes, that does not necessarily mean that those are the secrets of nature that adepts were talking about. One would only know that if they were given proper instruction as to what part of Nature alchemists were referring, and what specifically was to be understood through experience. Sitting outside and contemplating nature is not going to get one very far if the keys to one’s own nature and how that fits into everything else (epistemology) are missing. There is a natural structure to the levels that one can approach initiatory alchemy and magic, not determined by any exterior authority, but determined by Nature herself. Essentially, whatever level either is approached on is the level it is going to meet the seeker on, because they are all sentient processes. Inherent within that notion of the ‘level’ is the idea of a proper understanding and context (thus the importance of proper instruction in the theory of the work). There is a spirit, an intelligence, that goes with every one of those processes and it knows what the purity of one’s intention is. If someone wants to study magic from a desire to get power over people and manipulate things, some of that can be experienced, but there is a glass ceiling and that person is only going to get so far. In the end, it is going come around as a sharp bite. If the true intention is pure, to learn, so that one can evolve and serve, then one is going to get much further with the process. Brazen egoic entitlement can have no place in the intention despite its pernicious prevalence in today’s culture on all levels. The seeking of illumination for the sake of illumination, because it is there to be experienced, and because seeking understanding of it is required to evolve to the next level of what humans have the inherent embryonic capacity to become, is its own reward. While true illumination is not about gaining particular powers, the curious thing is that there are evolutionary powers and benefits that accompany the pursuit of illumination; they can serve as benchmarks on the path. Furthermore, though they are not the objective themselves, not achieving those benchmark powers and experiences is a sign that little evolution is actually occurring. For anyone that really wants to quench the spiritual thirst felt in the soul, pursuit of true illumination and its accompanying experiences are the only things that will satisfy it. There are many things one can explore that seem interesting that will satisfy for a while, but they lead to burn out because they do not reach that deeper soul-quenching level. The deeper level is what people are really seeking on a soul level; it is what their spirits want them to find. It is just that they have to get to the point where they are ripe enough to be spiritual fruit that the universe can pick and say, “Okay, you are ripe enough to do this now.” Ripeness is part of the evolutionary illumination process. Finding paths that lead to real illumination is what seriously spiritual people should be seeking. The paths that I found that work for me, that I also know how to help other people with, are illuminatory seership, practical alchemy, and what I call deep magic, which is magic applied as sacred initiatory science. The purpose of all three of those streams is illumination, and any one of the three paths can be approached as its own path, but when they are used in combination with each other, then they accelerate the total process all the more. People approach these practices according to their own affinity, but I also encourage them to learn aspects of other illuminatory practices because it accelerates their own understanding of whatever path with which they do have the most affinity. I think that is one of the best pointers that anyone can give, to expand one’s subjective synthesis in a manner that is very practical, not just collect more information with no way to ground it into practice. As part of my Open Seership Project, I offer free illuminatory seership training because it is something that, while quite profound, it is also relatively simple for people to practice. If they do it and they follow the instructions, then they can come to have their own direct experience of something that is truly phenomenal. Once they have that, then they will have the conviction for themselves to know that these aspects of the Mysteries are real. After that stage, then they can decide whether they want to study deeper levels of truly illuminatory practices. Sometimes seekers are not really as ready for it as they think they are, because they have not had truly phenomenal magical experience to be able to discern the difference. If that is the case, some come right up into contact with something real, and they run the other way due to the influence of certain guardians doing their jobs. However, for seekers that are ready to not run the other way, even if they must face some challenges, it is a very good step into an entirely different level of experience. For seekers considering whether to enter real alchemy work, it is recommended that they read Practical Alchemy to know more about my views on the subject and feel more comfortable to request private alchemy training. I begin the Prima training with a process that leads students to achieve true quintessence in an average period of 3 to 5 months. That is a skill set they then have for the rest of their lives, and can lead to opening many more doors to deeper spiritual growth. It is real work, but it is real alchemy, and will resonate with some as a piece they have been missing. For me it was the capstone, as it will be for others who will know within themselves the truth of it because they will feel a strong pull towards the path of learning the high alchemical arts. As a deeply pragmatic spiritual person, I focus on real processes that offer true benefits in achieving substantial expansions of consciousness within practical approaches to the Western Mysteries. The West has its own initiatory systems without relying on imported teachings. Truly magical practices have a real alchemical component, just as real alchemy produces truly magical initiatory experiences. Anything less is simply not enough for me, as less will not quench the thirst in my soul for continually deeper levels of understanding. If you are of the same nature, even though we are each on our own paths, I encourage you to walk this path with me. Together we will take the most amazing journeys.